The front side fix window assembly can be reused. When installing the window, if any of the clips on the front side fix window assembly are broken, butyl tape can be used to support the glass until the applied adhesive hardens. When using butyl tape to temporarily secure the window, make sure that the butyl tape is not applied exactly at the original clip location. If the butyl tape is applied exactly at the clip location, it will cause the window to protrude. (a) Remove the front part of the front door opening trim weatherstrip to the extent that allows removal of the front pillar garnish. 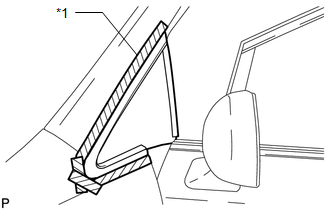 (a) Apply protective tape to the installation position of the front side fix window assembly on the vehicle body. 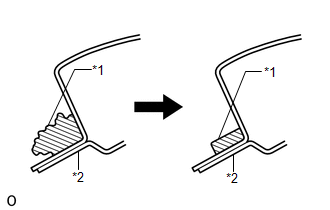 (b) Place matchmarks on the front side fix window assembly and vehicle body on the locations indicated in the illustration. Matchmarks are not necessary if the front side fix window assembly is not going to be reused. 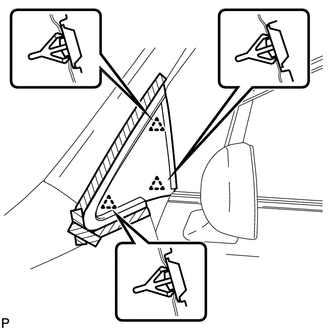 (c) Pass a piano wire between the interior vehicle body and glass from the interior as shown in the illustration. When separating the front side fix window assembly from the vehicle, be careful not to damage the paint or interior and exterior ornaments. 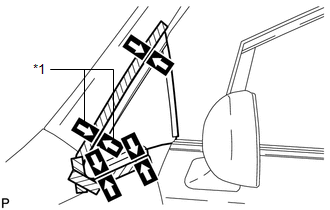 (e) Cut off the adhesive by pulling the piano wire around the front side fix window assembly. Leave as much adhesive on the vehicle body as possible when cutting through the adhesive. (f) Disengage the 3 clips. (g) Using suction cups, remove the glass. Be careful not to drop the glass. (a) Clean and shape the contact surfaces of the vehicle body. 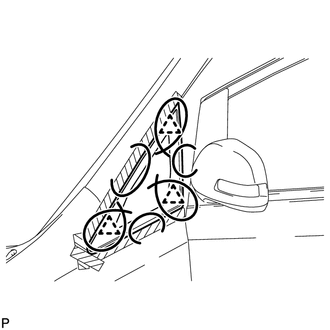 (1) Using a knife, cut away excess adhesive on the contact surfaces of the vehicle body as shown in the illustration. (b) Clean the contact surfaces of the vehicle body with a piece of cloth saturated with cleaner.